Model Arizona Muse on Pregnancy: "At First I Was Like, 'I'm Going To Be Fat Forever!'" 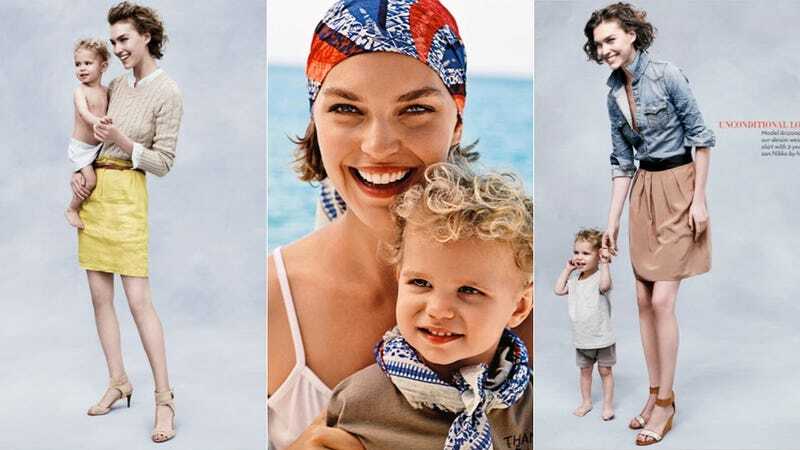 Arizona Muse maintains that there are "plenty" of models who juggle baby-birthing and having a job, but, when pressed by the Telegraph, admits that her pregnancy might have been a little different because she had a kid first and then made it big. "I think the others were established before they had children. I had a child and then became established, which I would not recommend doing! I highly recommend getting your career established first and then having children." Muse, 23, is the single mother of a 3-year-old son named Nikko (who has already starred in a few fashion shoots). She started working as a model in her teens, but her career was not so successful that her old agency had any qualms about dropping her when she became pregnant in 2007. It took her over a year to get back to work. And Muse doesn't pretend that she lost the pregnancy weight in six luxurious weeks of newborn bonding, painless breastfeeding, and sipping on green juice. "At first I was like, 'I'm going to be fat for ever!' I think we all feel that way after we have a baby. I threw away so many clothes thinking that it would be so depressing having them sitting in my drawer when they're never going to fit me. I got rid of my favourite pair of jeans, which of course would fit me now. You just have to give your body time. You can't have a three-month-old baby and think, 'That's it for me.' I tell mothers that you have to wait a whole year before you start judging your body, before you start working on it."